Nearly twenty-five years ago, in an act of terrorism that stunned the world, Pan Am 103 exploded over Lockerbie, Scotland, killing 270 people. The Longest Night: A Personal History of Pan Am 103 begins with the author receiving the nightmarish news that her husband, Tony Hawkins, was one of those 270. How is she going to tell Alan, their six-year-old son? Helen Engelhardt takes readers on an intimate, year-long journey of grief, outrage, and loving remembrance, against a backdrop of international politics, media frenzy, and courtroom negotiations. 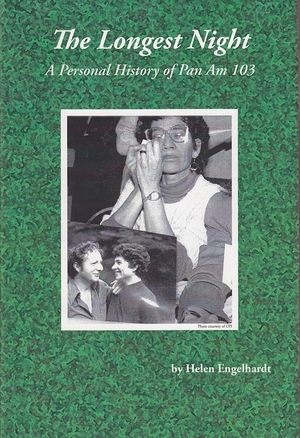 To keep Tony present for both herself and Alan, Engelhardt mixes memories, documents, recordings, and headlines in a narrative that is, at once, deeply personal and profoundly universal. At the heart of this richly detailed memoir is a family love story and a quest for justice for the innocent victims of senseless hatred.